Sega used to be the master of arcade games in the '80s. Hit after hit would come out every few months and most of them were made by the legendary Yu Suzuki. 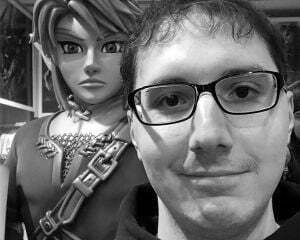 This guy had more creative ideas than anyone else in the field and his legacy has lived on to this day. One of his earliest games, Hang-On, was such a big hit that he eventually took that same concept and expanded it to include a car. This gave birth to Out Run, a game that pushed the boundaries of graphical technology and was one of the first titles to offer non-linear progression. You were tasked with racing a car at high speeds down a highway to reach one of five endings before a timer ran out. Traffic peppered the roads in an attempt to prevent you from hitting that goal, along with your ability (or lack thereof) to make turns with split-second decisions. It was a hugely addicting game with colorful graphics, lots of great music, and plenty of charm. Does it still hold up, though? While there may be some better examples of this particular type of racer, the new Sega Ages release of Out Run proves Yu Suzuki struck gold 33 years ago. As explained above, Out Run is a simple game. You race from a starting point to one of five endings, taking different paths at splits in the highway to beat out a clock. At each checkpoint, you earn some more time and then need to race through a tougher area to hit the next checkpoint. When you master the quirks of each area, it's unlikely you'll take more than six minutes to finish a run. A lot of the charm of the original came from its unique cabinet design. 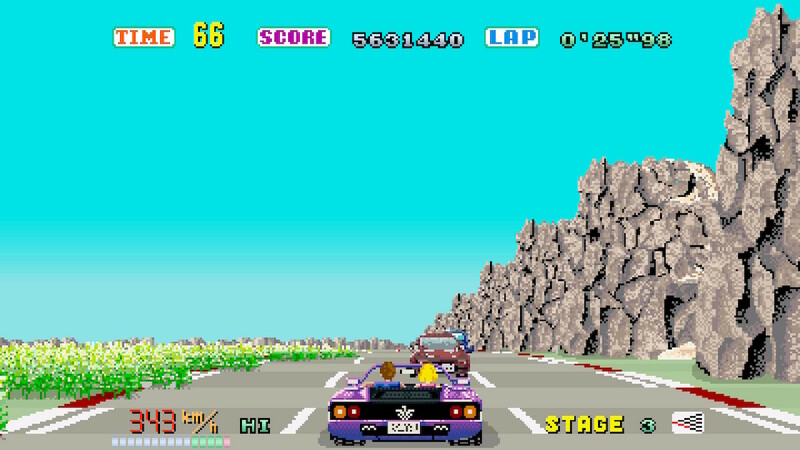 In an era where most arcade games where just simple monitors with joysticks and buttons, Out Run had a full seat with pedals and a shifter to simulate being in a sports car. I haven't actually experienced the game in that setting, but it's easy to see why people were so attracted to this racer in the '80s. Still, the simple charms of Out Run don't rely on that gimmick and there is quite a bit of fun to have with the home versions of the game. The colorful graphics and absolutely amazing soundtrack make it easy to get sucked into this crazy world. I'm not sure if the designers were attempting to go for realism, but this looks like a sunny comic book getting the animated treatment. The sprite warping and reshaping works fairly well and creates a decent illusion of distance and spacing between cars. It doesn't hold up quite as well as later arcade games, but it also avoids the awkward look that digitized graphics from the '90s now suffer. Out Run was also pretty revolutionary in that it allowed players to select multiple songs during runs, which makes different runs feel unique. As for things like game feel and strategy analysis, there isn't a whole lot to Out Run. It was developed in an era where catching a player's eye from the marquee was important. Developers needed to explain the game as quickly as possible and make the barrier to entry as low as they could to be successful. The graphics were flashy, the game had an incredible sense of speed, and it broke new ground. The car handles like you'd expect and traffic is as annoying as any roadblock should be. What more would you like to know? What I can talk about is how excellent this new Sega Ages port is, because I'm pretty blown away by the additions to the original classic. Being developed by the majestic M2, Sega Ages Out Run features full widescreen support and 60 FPS playback. This isn't some stupid filter slapped on to simulate widescreen, but an honest-to-god expanded view that helps make the game feel larger than life. Playing it on a massive HDTV actually looks damn great, even for a game that is old enough to have children. You get a hugely expanded selection of songs, taking the original three and including around 10 more with some remixes and megamixes in tow. Unlockable car upgrades are now included, meaning you can tweak your runs to give yourself an edge and create speedrun times to challenge your friends with. There's even the addition of a "New" and "Old" course (basically a remixed version of the track) along with a recreation of the original arcade experience (30 FPS and only three songs). Gyro controls simulate using a steering wheel if you're into that, too. It’s awesome. It doesn't take long to unlock all of those extra parts (especially since you can tweak the difficulty to remove traffic or give yourself nearly two minutes per checkpoint), but I had way more fun than I should have playing with each upgrade and changing the car color. It's crazy how something so simple got me excited to replay Out Run about 15 times in a row. I think a lot of my appreciation for this title came from its inclusion in Yakuza 0, but it's hard to fault an arcade classic for being simple and fun. If you played the 3DS version of Out Run, a lot of this will sound similar. The Sega Ages port is based on that and even includes the new songs created for that version. It obviously lacks stereoscopic 3D, but you still get to retain the portability and even have the Switch's unique features to play it at home. I suppose it might be a hard sell if you already have the 3DS port, but you can't be mad at the quality presented here. As with the previous Sega Ages releases, the biggest factor against Out Run will be the price. $7.99 is a lot to ask for such an old game, but this is exactly what I'd like to see more of for classic re-releases. Getting widescreen support in such an old game is amazing and having the actual gameplay improved with increased fluidity takes it beyond the limitations of its era. Out Run isn't suddenly going to win racer of the year, but this is easily the definitive version of Yu Suzuki’s classic arcade game.